Hello all! This is my trench report from Dhiban–I wrote it last July. I found out today that the season report has gone to the Jordanian Authority, so it should be okay to publish. Now you too can enjoy boring archaeological gray literature! The photos are mostly by Evan, the site photographer in 2010. In the summer of 2009 Danielle Steen and students from Knox College performed several 5m x 5m surface collections at Tall Dhiban. 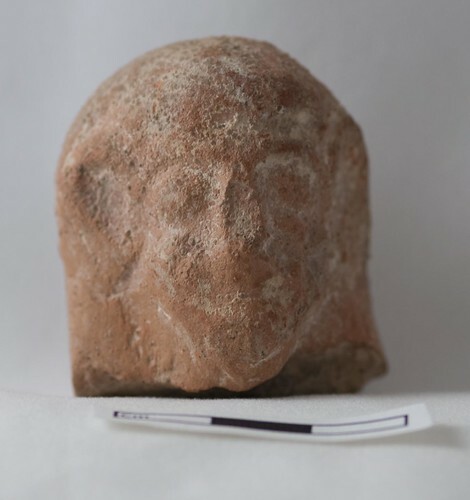 These collections had concentrations of Middle Islamic, Byzantine, Roman and Iron Age pottery that seemed to correspond to different occupations of the Tall. To affirm the veracity of these surface finds to the underlying archaeological remains, two 2.5m x 2.5m test trenches were excavated late in 2009 and four additional trenches were opened up in 2010. One of these trenches was BO27. After some disagreement regarding exact placement and grid coordinates, BO27 was opened up on June 27, 2010 on the second terrace on the west side of the tall. The surrounding architecture suggested that BO27 contained a structure, so the area of the trench was expanded from the normal 2.5m x 2.5m size to 2.5m x 5m, along the east – west axis. This enlarged size ensured that a large double wall (locus 14) would be investigated during testing. Though there were additional walls visible to the east and north of the trench, excavation was not extended to include these features. In future years it could be well worth expanding the arbitrary trench to correspond to existing architecture in order to truly phase the building. As the building was not fully excavated, this report can only contain partial information regarding the building’s sequence and possible purpose. The trench was initially covered by shoq and small, shrubby, thorny bushes and ground cover. This was removed as (locus 1). The trench also lay in the middle of a heavily trafficked goat path and goats and their human caretakers remained an issue most of the season. This top soil was only partially sieved and artifacts were hand-picked for the most part. Happily, removing this top soil layer revealed an east – west wall (locus 15) abutting and returning from the large double wall visible at surface (locus 14). This wall (locus 15) was at the southern extent of the trench and contained all subsequent building fills. After (locus 1) was cleared, an underlying pit (locus 5) containing dark, silty dirt and large amounts of cobbles and rubble (locus 4) was perceived to cut the trench to the eastern extent. The true extent of this pit is unknown as it ran into the limit of excavation to the northern and eastern extent of the trench, but the excavated area in plan was 1.2m x 2.5m with a depth of .28m. Finds in the fill of the pit (locus 4) were relatively sparse and mixed with artifacts with a TPQ as late as the 1970s at depth. This pit appears to be extremely late in date, and dug to rob out stone for use in building elsewhere. Again, as the extent of the pit was not explored, this cannot be said with much certainty. Excavating the pit cut (locus 5) provided an informal section of the stratigraphy of the fill of the building. Underneath the general top soil layer (locus 1) and cut by the modern pit (locus 5) was a generalized fill (locus 3) with occasional rubble that appears to have rolled down the hill as the building filled with alluvial dirt. 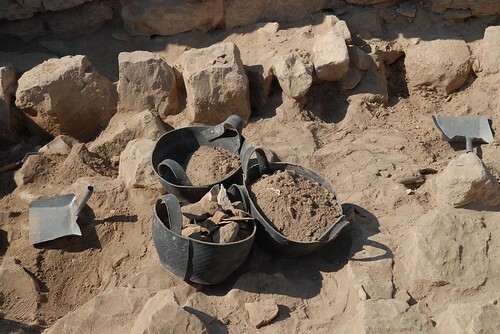 Finds associated with the fill (locus 3) were mixed and did not contain an overwhelming indicator of the date of the building. 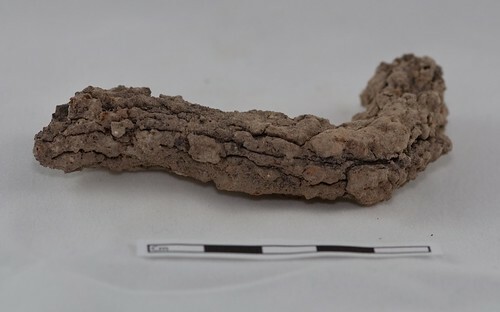 This layer of fill (locus 3) terminated with a layer of bricky, construction-like materials that were mixed with plaster (locus 6). The construction materials in this layer of fill (locus 6) seemed to be associated with the structure contained by the N-S (locus 14) and E-W (locus 15) running walls, rather than miscellaneous fill. This layer contained the most fill, with 154 gufaf removed before reaching the next layer. There were also several .2m to .4m boulders that seemed to form a collapse of some kind, but not as dense as collapses in other buildings, such as those in BR44 excavated in 2009. This construction/collapse fill (locus 6) terminated in a layer of disturbed flagstones (locus 7). The excavation of locus 6 revealed an installation (locus 8) abutting the N-S wall (locus 14) that extended into the north section. The installation (locus 8) was built out of miscellaneous limestone blocks, probably reused from other contexts. The true extent and shape of the installation is unknown as it extends into the LOE, but the visible dimensions were rectangular, with a height of .38m and a width of .56m. Please see the isometric drawing in the BO27 archive for details regarding the stone size and shape of the installation. There were the remains of a mudbrick/makeup surface on top, possibly sealing the installation. Under this mudbrick/makeup were a series of flat stones, further sealing the interior of the installation. The general morphology of the installation suggests that it is a bin, and previous excavations of similar features support this interpretation. After the flat stones were removed, the interior of the bin was excavated as fill (locus 9). The bin fill was loose, fine, and homogenous, much like the interior of the bin in BR44, excavated in 2009. The interior was collected for a 100% flotation sample, but as the sample was being gathered, very few finds were identified in the fill. At level there were several sandstone cobbles, a few of which were gathered for geomorphological investigation in bag 65. The bin fill terminated in large stones that appeared to be flagstones. Upon further investigation they lined a pit (locus 12), probably to level the installation (locus 8) as the primary build for the bin employed ashlars that were set into the pit (locus 12). As the stones also overlay the flagstone surface (locus 7), the flagstone surface was probably built first, then the pit for the installation (locus 12) was cut into the flagstone surface (or what remained of it), and the stones comprising the bin and the leveling stones were installed, along with fill (locus 11) surrounding the rocks. It could be argued that the fill of the bin (locus 9) and the fill of the pit (locus 11) are the same material, but they are associated with slightly different building contexts and were collected and treated as separate fills. The construction of this bin was different than the two other bins I have observed on site, in that the foundation for the bin was cut into the surface, rather than placed on top of the surface and leveled with chinking stones under the primary construction ashlars. 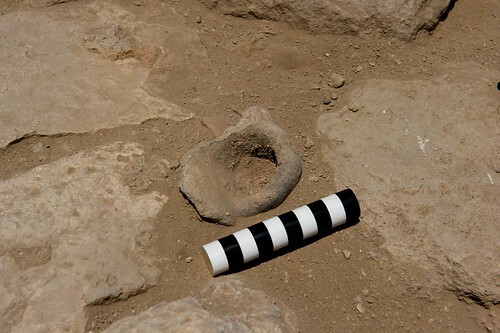 The cut also had a slightly irregular shape, not conforming to the dimensions of the bin, but the extent of both the pit and the bin are unknown, as they were not fully excavated. The flagstone floor (locus 7) was comprised of several flat stones, from .4m to .6m, placed on a relatively level surface and intact to the western extent of the trench, but truncated to the west. These flagstones were possibly disturbed or robbed out to the eastern extent, possibly by the previously excavated modern pit cut (locus 5). These stones also appeared to be disturbed by a collapse, as several were turned on their sides with other stones embedded around them. Lodged between these flagstones was a diagnostic Middle Islamic pot handle, collected as Special Find 2. Other sherds found in the fill (locus 10) refit to this diagnostic find. This seems to imply that the last certain phase of occupation of this structure was during the Middle Islamic period. Beneath these flagstones was a coarse, pebble-filled fill (locus 10) that seemed to act as a leveling fill for the stone floor. Removing the coarse, leveling fill (locus 10) revealed a bright, abrupt color change to a compact, reddish fill (locus 13) with small charcoal concentrations. None of the charcoal was very cohesive, nor did there appear to be a pattern of burning. 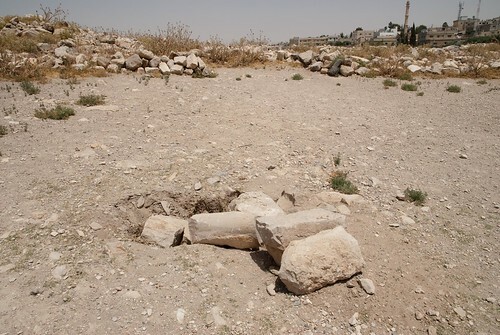 This fill was initially left as the terminus for the trench, as the primary purpose for excavation was to identify the last phase of occupation, which appeared to be during the Middle Islamic period, as both the flagstone floor and the fill beneath it contained clearly diagnostic Middle Islamic artifacts. The trench was cleaned and prepped for drawing and final photographs, and left while I went to investigate one of the cisterns on site. We came back to the trench several days later and excavated the reddish fill layer (locus 13), but in the intervening days the dirt had dried considerably and was at times difficult to chase while excavating. This fill contained several unique objects and the bulk of the Special Finds recorded in BO27 in 2010. Among these finds were a worked shell (SF 5) and a .05m x .03m square copper plate (SF8) with two holes in the middle. Also found in the sieve from the fill were a metal arrow and a metal plate. Removing this fill revealed a grayish fill that had several possible flagstones intermixed with the fill and a tabun in the southwestern corner, close to the N-S (locus 14) and E-W (locus 15) running walls. This is very likely the next phase of occupation, but it remains unexcavated. While only three courses of E-W wall (locus 15) were revealed during excavation, some preliminary descriptions of the wall are possible. 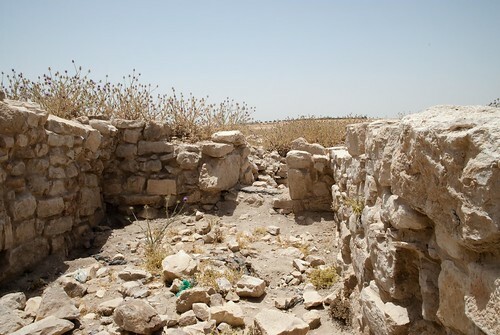 This wall appears to be rubble filled, but the extent of the wall was not investigated to the south so it is difficult to be certain. This wall was built abutting the N-S running wall (locus 14) but further stratigraphic relationships can only be revealed with further investigation. The wall (locus 15) appears to extend to another wall to the east of the trench, but, again, it is not possible to tell without excavation. The wall was built with shaped stones and two Nabatean ashlars, indicated in the elevation drawing by a small, interior dashed line. It appears to be relatively well-built, yet entirely out of stones re-used from other structures. More speculation about this wall will be discussed in the phasing. 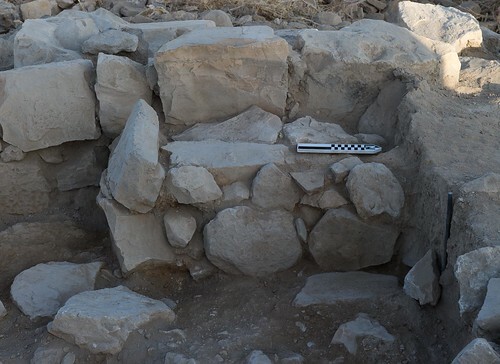 Most of what has been described has been the fills to the east of the N-S running wall (locus 14) as the remains are associated with a structure. 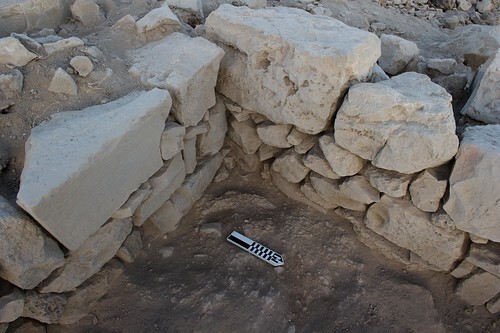 The test trench also contained a portion of another N-S running wall, built abutting (locus 14) and cleaned off (locus 2) to reveal the extent of the wall and its relationships to surrounding architecture. This part of the trench was deemphasized this season, so the investigation of it remains rudimentary. The double walls were both rubble filled, but appear to have been robbed out extensively, and cut by military trenches both to the north and to the south. While the N-S running wall (locus 14) associated with the finds described above remains relatively intact, the wall abutting its western is heavily disturbed and was under a large amount of collapse, much of it rapid collapse, with large air pockets and underneath the stones. At midpoint in the trench the wall seems to disappear entirely into a cobble collapse. While phasing a building that has only been partially excavated is impossible, some preliminary speculation regarding the episodes of occupation and collapse can be discussed for the building partially contained in BO27. I. Modern use – The modern pit (locus 5) and the goat path (locus 1) shows that this part of the tall is still very much traversed and used for construction resources. During the course of excavation the rebar used to delineate the extent of the trench was pulled by one of the shepherds who expressed his worry that the goats would cut their legs. While the structure is no longer permanently occupied it is still used for the resources that it contains, primarily fodder and stones. II. Building collapse/removal – The rocky mixed fill (locus 3) seems to contain rocks that either collapsed or were washed in by alluvial action. This fill does not contain nearly the amount of rocks that would have indicated a complete building collapse. I speculate that this fill represent a period after possible removal of standing remains by the Department of Antiquities in the 1950s. I believe this is supported by the rapid collapse to the western extent of the building, possibly showing that the building was pulled over, downslope. Then I believe that the visible architecture was removed to a single level, explaining the even coursing of the E-W running wall (locus 15) and relatively shallow stratigraphy of the building partially contained in BO27. Confirmation of this speculation may be revealed in early aerial photos of the tall, but it remains speculation until that time. III. Disuse/interior collapse – The mixed construction fill (locus 6) overlying both the flagstone surface (locus 7) and the installation (locus 8) contains plaster and bricky remains, possibly the interior finishing applied to the building that collapsed over time. IV. Reuse – The bin (locus 8) installed in the interior of the structure has been interpreted in other structures as containing fodder for domesticated animals, probably goats. This would indicate that the building at this time was still at least partially standing in order to contain the livestock. It is difficult to say how intact the flagstone floor (locus 7) was at this time, but the use by animals could explain some of the general wear to the surface. V. Rebuild/occupation – The flagstone surface (locus 7) was in place before it was cut by the bin, perhaps indicating the building’s use as a domestic structure, but there are no other features associated with this phase and to affirm this speculation further excavation is required. The gravely, leveling surface (locus 10) seems to have been laid in order to establish a firm construction foundation. VI. Conflagration – The reddish-brown burnt surface (locus 13) beneath the leveling surface (locus 10) seems to indicate an incident of burning and while there were a few, scattered burnt rocks, no other indications in the stone in the walls could be seen. 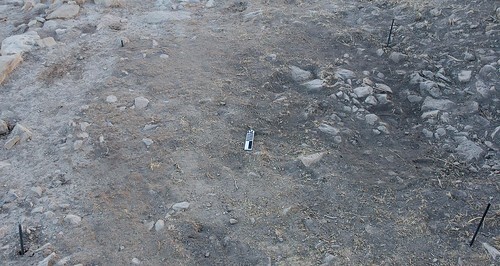 The finds within this layer were relatively rich, perhaps indicating an accidental burning. VII. 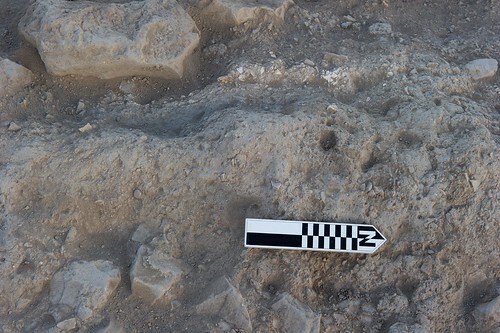 Occupation – the flagstone surface beneath the burned layer (locus 13) and associated tabun indicate a domestic occupation of the building, but it remains to be verified in future seasons. This building appears to be Middle Islamic, at least in the last phases of occupation. 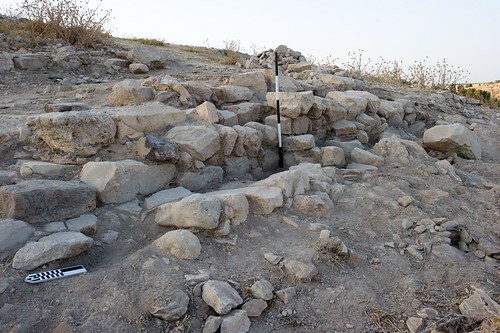 The trench is positioned on an outcropping overlooking the wadi and area thoroughfares. Early speculation regarding the trench included its possible use as a tower, as it was abutting a possible fortifying double wall that extends along the contours of the tall. 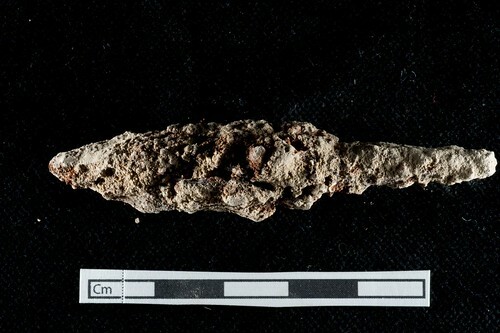 This would seem to be supported by finds associated with phase VI, including the arrowhead and bits of copper plating. Yet the previous occupation contained a tabun, suggesting a domestic structure, and later use included a pen for housing animals. The building partially contained within BO27 seems to reflect the reuse extant throughout the site, of occupation and reoccupation, reconfiguration and reuse of the tall’s materials for changing needs throughout time. The countryside around Dhiban is greener than last year–it may be because I’m here earlier or I might have gained a bit of perspective from wandering around in the desert beforehand. It was the same dusty Madaba bus station though, then the same twisty road through the wadi, then Dhiban’s tiny fruit stands and claustrophobic streets. The businesses were about half-shut, as it was noon–nap time in the civilized world. There seemed to be a couple more shops though, so maybe things are looking up in Dhiban-land. I was a little anxious re-visiting the site. Would I see some of the workmen? Would I even be welcome? I had a particularly harrowing conversation the night before at a coffeeshop, where I had just finished watching the first game of the World Cup. It was the dawning realization that I was talking to a staunch anti-Semite who thought that we were digging for “Jewish inscriptions” to allow “the Jews” to take over that particular part of Jordan. No amount of talking could convince him and I was left pretty shaken. It was a pretty stunning example of the “full-contact community archaeology” that seems to typify work at Tall Dhiban. Puppies! Part of me aches when I see baby animals around site–we can’t really care for them or keep them, and sometimes being friendly invites disease or makes the animals less suspicious of people. I’ve also seen the broken creatures that they turn into–I had a particularly haunting experience with a kitten at Catalhoyuk, but that story is saved for over beers. Lots of them. I’ve been trying to come up with a better strategy for photographing artifacts while in the field in Jordan. There is a lot of nice, natural light but it’s so windy all the time that a rig with sheets or with paper scales can be difficult to manage. I decided to try out an inexpensive light tent. I thought about making my own, but these aren’t particularly portable and the more portable ones on Amazon were cheaper. We ended up getting this one, and it arrived in a box without instructions. Not that we really needed instructions to put it up, but folding the light tent back into a small enough shape to put it back in the case proved problematic. I found the lens to be really responsive during more out-in-the-world photography. 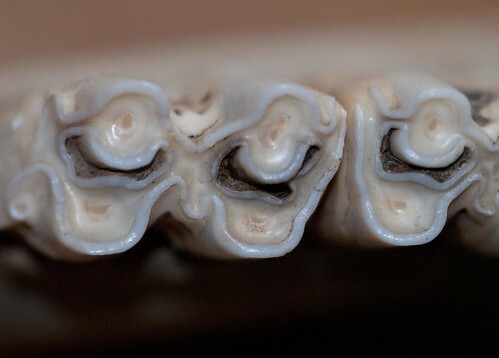 The photo of the mandible was taken without a tripod. It was also very good with artifact photography, but I struggled with the light tent, mostly because it put me far away from the artifact and it was hard to position a tripod correctly–nearly impossible to get above the artifact like you can with a regular photo table. This is a piece of metal recovered from Dhiban in 2009. Overall, not a terrible photo, and it will work for publication, but not ideal. This is the head of an Iron Age figurine that I side-lit to pick up details of the face. Don’t talk to me about those photo scales–it was humid that day and the stupid paper I used wasn’t thick enough to lay flat. I’ll replace them for final publication anyway. It’s also a bit dark–I haven’t mastered integrating Adobe’s Lightroom into my workflow quite yet. I’m really happy with the program overall though. The experience with the light tent was frustrating, but I may still try to make it work. We will likely take the tent itself to Dhiban, but maybe not the light rig–I think there will be enough ambient light to make it work.